A little hard on the bum, but nevertheless an immense pleasure. I woke up Friday morning with absolutely nothing on the agenda. After catching up on some writing and photo editing, I hopped on my bicycle and headed down the Rue Berri cycle track, with no specific destination in mind. 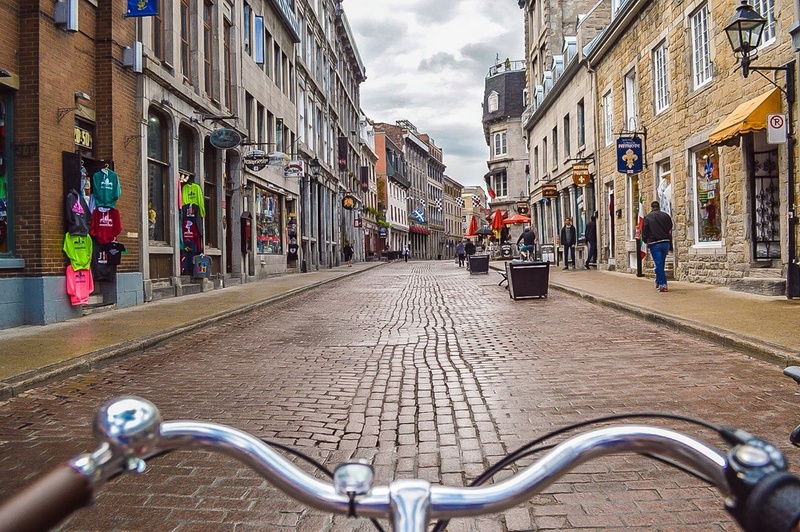 Before I knew it, I was peddling aimlessly around the cobbled streets of old Montreal. And while I have visited this area before, it was an rare treat to experience it on a calm, quiet Friday morning; without the usual crowds of tourists (and locals) who flock there on the evenings and weekends. One of the many converted loft buildings lining the Lachine Canal. 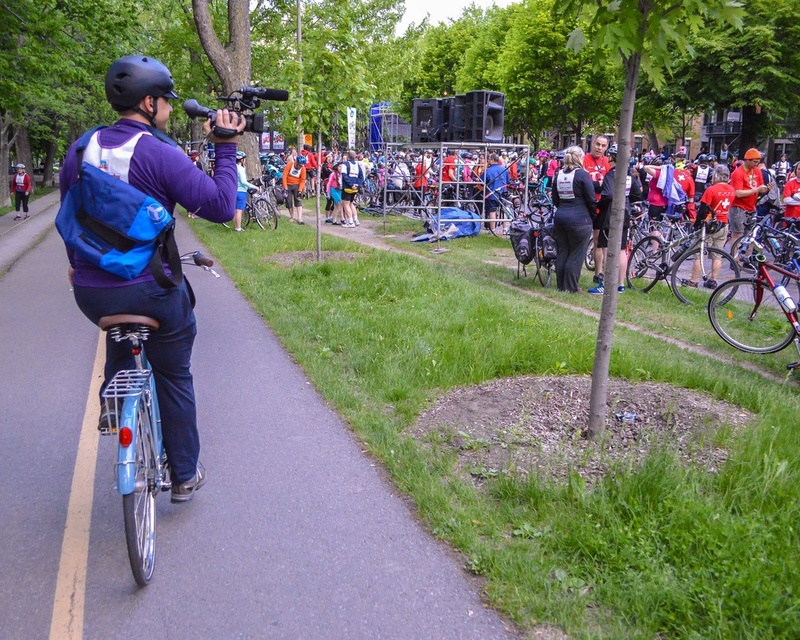 I then found myself cycling west along the Lachine Canal, a historically significant waterway that is now transforming into a busy and vibrant corridor. The industrial factories that once lined it are now being converted into lofts, shops, and restaurants. 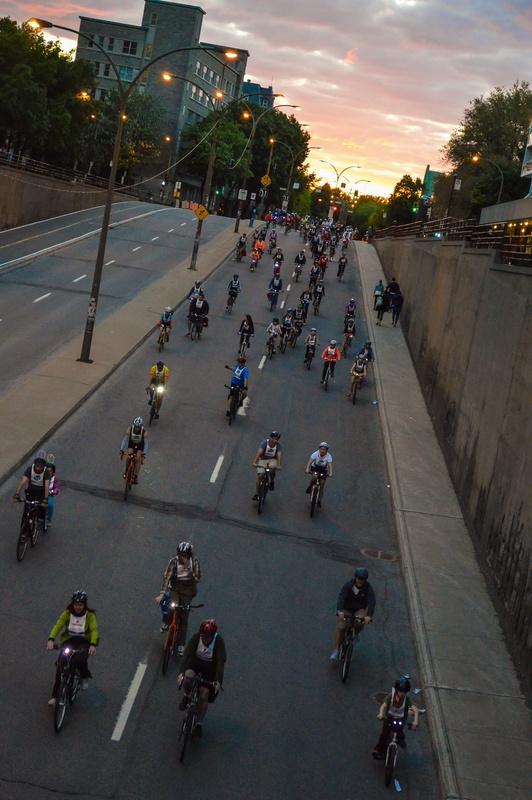 It also boasts one of the longest and oldest bike paths in Montreal: a 15 kilometre trail that was built in the 1970s with federal funds. 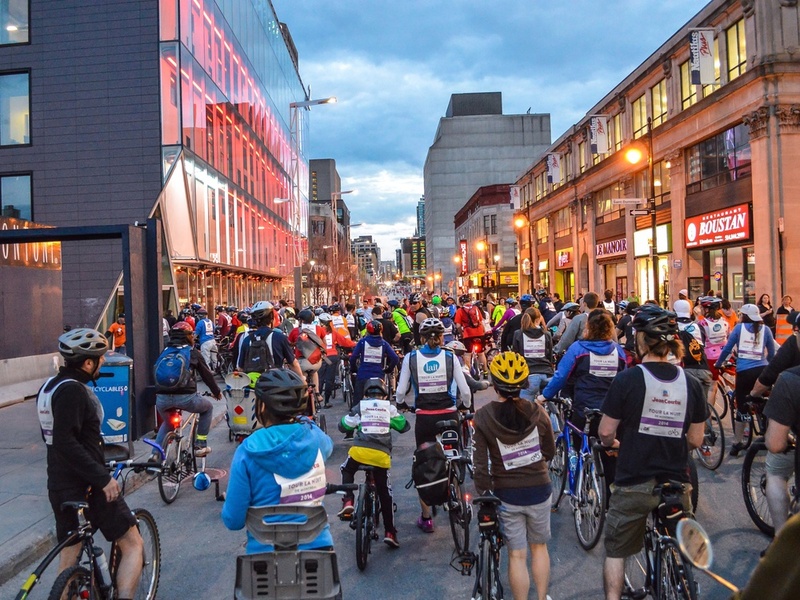 While it was first met with resistance by Montrealers, is now widely regarded as one of the top ten urban cycling experiences in North America. It was at that point I decided to stop in to Allo Velo, a cool little bike shop and café on the west side the city. Lamar (the owner) and I had been following each other on Twitter and Instagram for over a year, and finally met in-person for at the Rendez-vous Cycle Chic the night before. His passion for upright, civilized, slow city cycling rivals that of my own, and it was amazing to see that reflected in a retail setting. Lamar made me an Americano and we chatted for almost an hour about the various high-end bikes (Gazelle, Creme Cycles, Trio Bike, etc.) he carries, and the difficult time he has keeping them in stock this time of year. It was reassuring to see, but that positivity quickly turned to sadness when I considered a shop like this would never be able to survive in Vancouver. Mr. Straphanger himself: Taras Grescoe. Then came my first genuine surprise of the weekend. I had contacted Taras Grescoe a number of weeks ago to let him know that I was coming to Montreal, but never did receive a response. Being the best-selling author of Straphanger (a personal favourite of mine, and a tremendous influence on much of my own writing), he was understandably a busy guy, but emailed to say he some a free time if I wanted to meet for coffee? I jumped at the opportunity, and spent a engaging hour on the patio at Club Social exchanging back stories, anecdotes, and ideas about future projects. Clarence from Streetfilms doing his thang. And then, as if meeting one of my influences wasn't enough, I returned to the hotel to meet Velo Quebec's other invited guests for the Tour La Nuit. There I realized I'd be spending the evening with the one and only Clarence Eckerson Jr. - the man behind Streetfilms, who was in town to film the festivities. Clarence's short documentaries about safe streets, public transportation, and bicycling have become an (Urbanist) Internet sensation. His recent film about the Dutch city of Groningen - which enjoys a 60% cycling mode share in the city centre - is one I have watched repeatedly, and find myself constantly referring to. Bicycles as far as the eye and see (and further)! After a delicious dinner with Velo Quebec staff at La Maison Des Cyclistes, we made our way to the starting line of the Tour La Nuit, in nearby Parc La Fontaine. We were treated to a rare bird's eye view from one of the viewing platforms, and documented nearly 17,000 people preparing for the night ride. None of us could really comprehend that many people on bicycles at once, so when we were told that the (staggered) start of the ride would take over hour and a half, we were totally blown away. The route took us through both Chinatown gates. The experience itself was transcendental: 25 kilometres of completely open streets stretching from the downtown core out to the suburbs. There were toddlers on Trail-a-bikes, teenagers on skateboards, and senior citizens being pulled along in bike trailers, many of whom were light up like a Christmas tree, and smiling from ear-to-ear. The route was also lined with many enthusiastic spectators, some of whom had brought chairs and lights to cheer on the passing crowd, and initiate a cacophony of bicycle bells. No need to stick to the cycle track when you have the entire street at your disposal! Several hours later, the ride ended at Parc Jeanne-Mance, where there were acres of bike parking, a rock band, food trucks, and some amusement rides for the kids. I was lucky enough to join some of the Velo Quebec staff in the VIP tent, and chatted about the history of the event, the complex logistics of bringing altogether, and how it has grown in size from year to year. In reflection, it also dawned on me that we do not have such an open streets event in Vancouver, unless of course, you're one of the few who partakes in the bizarrely masochistic act of jogging. 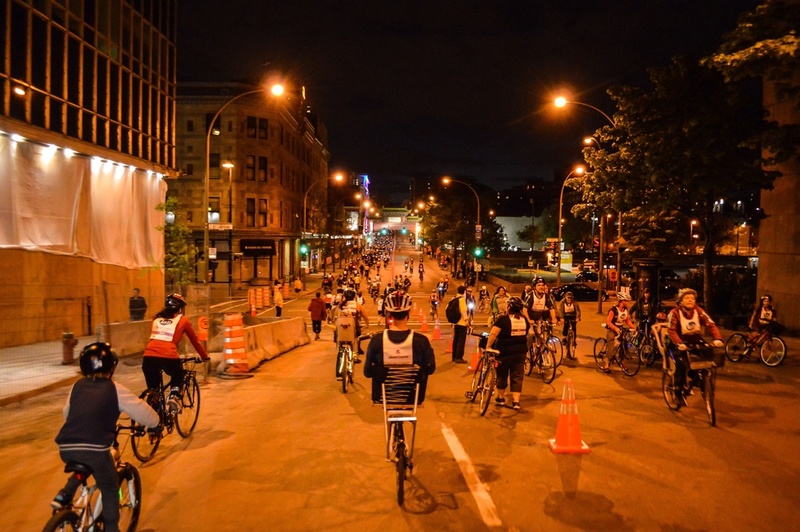 It was another incredibly late night, followed by a very early morning, but I somehow managed to find some time to edit and post my pics on Montreal Cycle Chic. Stay tuned for more bicycle-based adventures, as we prepare to ride the Tour de l'Île tomorrow!